This is such an easy and versatile recipe, add fruit, use other nuts and superfoods and make it your own! Vanilla extract, almond extract, lemon extract, orange extract! Add some cinnamon, nutmeg, clove, cardamom! You'll definitely be full till lunch! In a large bowl stir together a can of coconut milk with 1/4 cup chia seeds, 1 tsp maca powder, 1 tsp vanilla extract and a tablespoon honey and sliced banana. Meanwhile press 1 tbsp of almond or peanut butter into the bottom of small mason jars then pour mixture in. 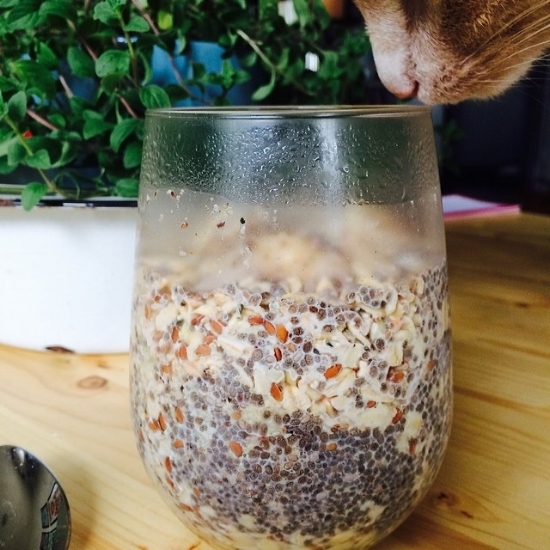 In the morning top with cinnamon, hemp seeds and sunflower seeds and enjoy!